Asking the right questions can help ensure a smooth implementation, 100% user adoption, and happier board members. Based on feedback from our customers, this free guide includes questions to ask a potential board portal provider before you sign on. Download now to make sure you ask the right questions when determining the best board portal provider for your company. What is the lead time from contract signing to first use? Is there a single point of contact for questions and training? What type of training is included, and is there an extra cost? How are product updates handled? How much control do I as an administrator have to make changes? Enjoy one central, easy-to-use platform for creating and distributing board materials, increasing board engagement and maintaining corporate governance. No need to wait for IT or BoardBookit to create users, assign to committees, or secure assets. Control is in your board administrator’s hands. Reduce labor, printing, and mailing costs by eliminating manual board administration tasks. 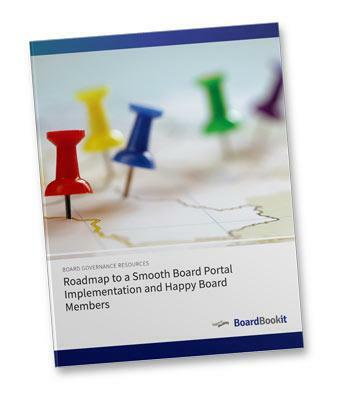 BoardBookit customers report up to a 50% ROI! Our customer care and support staff is standing by to answer any questions or help in anyway. Enterprise customers enjoy 24/7 support 365 days a year.